﻿ Homeland Guesthouse, Phnom Penh | FROM $7 - SAVE ON AGODA! Have a question for Homeland Guesthouse? "Staff are very kind and respectful." "Very good staff and nice room"
"Cheap rate + friendly staff Many local food around the corner Good for long term stay"
"Overall good value for what we paid." 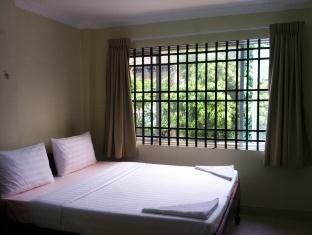 Built in 2010, Homeland Guesthouse is a distinct addition to Phnom Penh and a smart choice for travelers. Only 17 km away, this 2-star hotel can be easily accessed from the airport. For sightseeing options and local attractions, one need not look far as the hotel enjoys close proximity to Cambodia-Vietnam Friendship Monument, Cambodian Creations, Tuol Sleng Genocide Museum. At Homeland Guesthouse, every effort is made to make guests feel comfortable. To do so, the hotel provides the best in services and amenities. Free Wi-Fi in all rooms, taxi service, ticket service, 24-hour front desk, luggage storage are just a few of the facilities that set Homeland Guesthouse apart from other hotels in the city. Hotel accommodations have been carefully appointed to the highest degree of comfort and convenience. In some of the rooms, guests can find television LCD/plasma screen, additional toilet, mirror, towels, internet access – wireless. Besides, the hotel's host of recreational offerings ensures you have plenty to do during your stay. 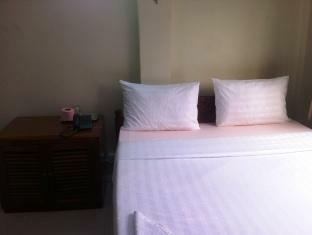 Whatever your purpose of visit, Homeland Guesthouse is an excellent choice for your stay in Phnom Penh. "Decent place for a short stay." Located a two minutes walking from Tuol Sleng Genocide Museum, that's its best point, the rest is just average. Helpful staff, they don't speak too much English but they try hard. Decent place for a short stay. Sometimes you gotta do what you gotta do. Stayed here a few weeks waiting for new passport, aircon made me sick for over a week, pillows were spotty black with mold. Great price but you might need to do some house cleaning. Also, double priced menu, one English priced and one Khmer. Not cool. 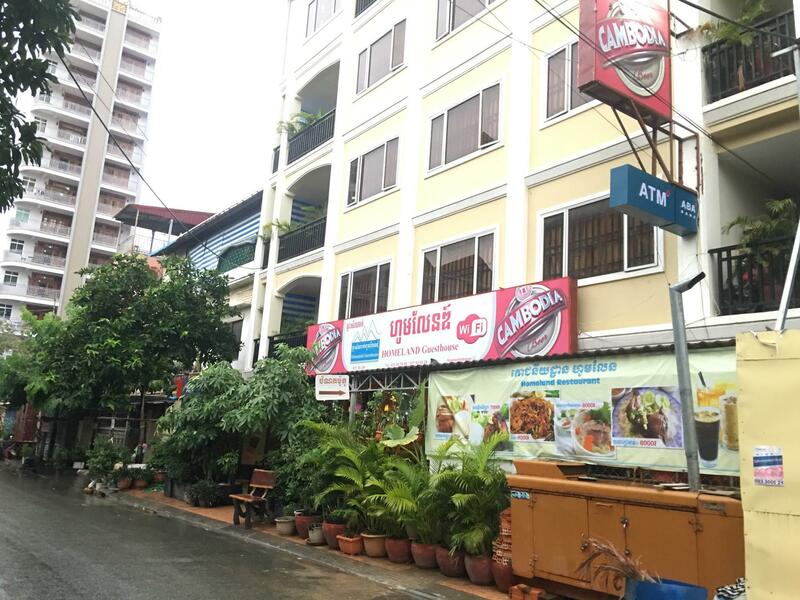 We stayed for one night, Phnom Penh is a busy and noisy city, but the guesthouse is located in a quiet area. Very good for those having business meeting in BKK area. The staff is friendly and efficient. If you get the right room Homeland is a good hotel. I tried four different rooms during my stay there, two smelled badly of mold, another had a cracked toilet and smelled of urine, and the fourth had a slight sewage smell in the washroom, but was tolerable and that was the one I stayed in for a week. The price could not be beat and the staff were all friendly and helpful. Other reviews said there were not many food options nearby which is not true, around the corner was a street lined with Khmer food, a market, restaurants, any kind of store you could need. If you want to eat McDonalds this might not be the area for you. I enjoyed my stay at Homeland and will be returning next time I am in Phnom Penh. This guest house needs urgent revamp to retain old customers. Stayed 3 nights in 2 different rooms, all unsatifactory. First night in room 406 : aircond not cold need to use fan. Bedsheet dirty and torn and with bugs. Changed to room 405 for next 2 nights. The toilet flushing system was down. 3 lights were out of service and the refrigerator malfunctioned giving loud bang every 20 min or so. Very friendly staff, helped me throughout my stay there. Nice, clean rooms and well-maintained. Inexpensive restaurant with great food in the front. Really happy with my stay here. They absolutely made my experience in Phnom Penh! Great value for money. Not too close to the main town but we were in Phnom Penh to mainly see the Tuol Sleng Museum and killing fields so location worked for us. Not too many food places around though so we just ate at the guest house. Staff were friendly and room was clean and spacious. cannot beat the price, hotel is clean, bed is good and staff super friendly 1 minor remark is there are a lot of dogs barking in the morning this hotel will be my 'base' for future visits in phnom penh!! 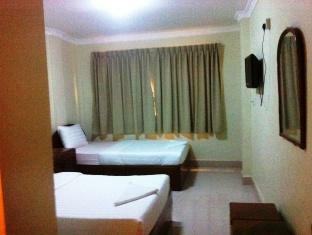 Not the nicest part of Phnom Penh to stay in, though according to other reviews it is "authentic". We aren't city people at the best of times, so "authentic" city life wasn't for us. The area is grubby and run down, with no foot paths so unless you get a tuk tuk you will be walking at your peril. We were hounded by the tuktuks outside the hotel too. We thought the food was way overpriced for what you got, but to be fair there is almost no other places to eat around. The staff were lovely, but the place itself is needing some upgrading. Our bedsheets had holes in them and the curtains were falling down. We also encountered a Rat in the food area one evening we were eating dinner. Enough said. I don't have many positives except you get what you pay for, we shouldn't have expected anything more. We stayed for 1 night on our way to Sihanoukville and got a deal for 9usd a night, we didn’t expect much but the hotel was great, big beds and very comfy, the room was big and clean, same with the bathroom. Food in the restaurant is alright, but you can get better for the same price anywhere else. Great staff too, helpful and kind. simple but clean. ask for the 3rd floor wich has been renovated. super friendly staff. The Hotel kitchen is super delicious and the beds are comfi. Also very quiet area. I would recommend to stay here for 13 bucks a night!